It’s finally installed! I got my new DELTA Faucet and I am LOVING it!!! 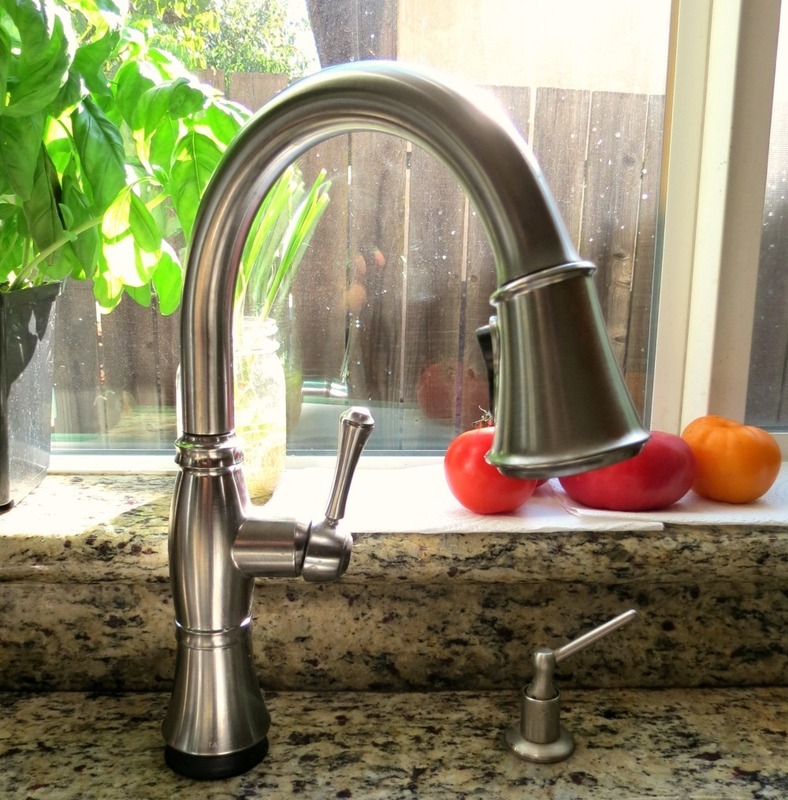 I am just so excited to show you my Cassidy Single Handle Pull-Down Kitchen Faucet with Touch2O® Technology! It’s so pretty, shiny and fun to play with!! Yes, a faucet can be fun to play with!! 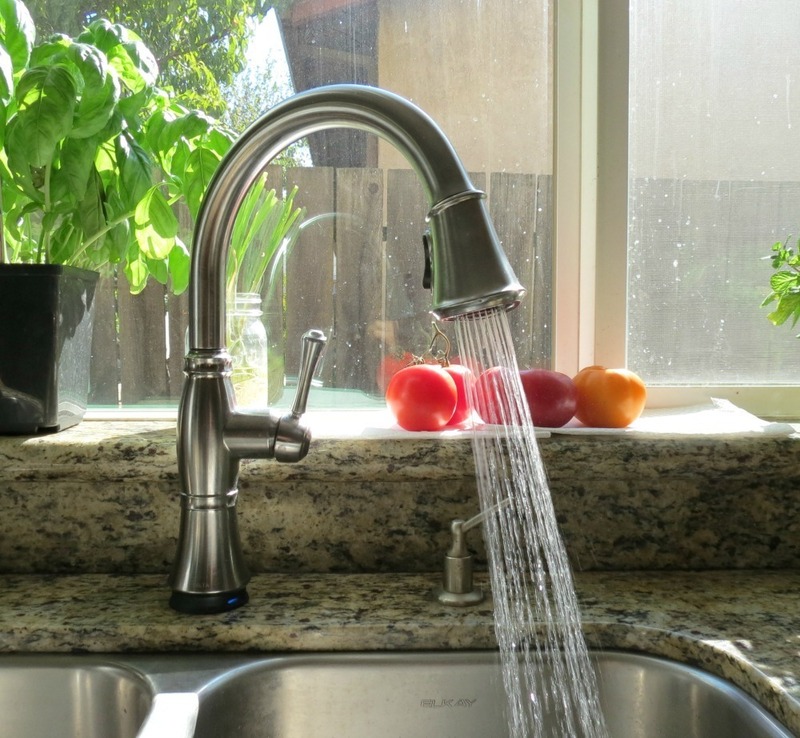 The Delta Faucet is so easy to use, just one touch does it all. No more messy finger prints on my faucet!! If I have dirty hands, I just touch my faucet with my arm and it turns on. It moves beautifully from side to side. Where my other faucet wouldn’t move at all. The temperature control is perfect and the faucet gives a nice flow of water. Here is a video from DELTA Faucet so you can see what I am talking about. I wanted to make a video to show you how much fun I have playing with my faucet, but my Husband wouldn’t make the video for me, so I will show you the one created by Delta Faucet instead. Besides DELTA’s is a little more professional than what I would show you. Pretty cool don’t you think?? I wanted to show you the before and after photos of my old, crappy faucet next to my new gourmet feeling one!! I really love the height of it!! I guess after looking at the before and after you can see why I love it so much! 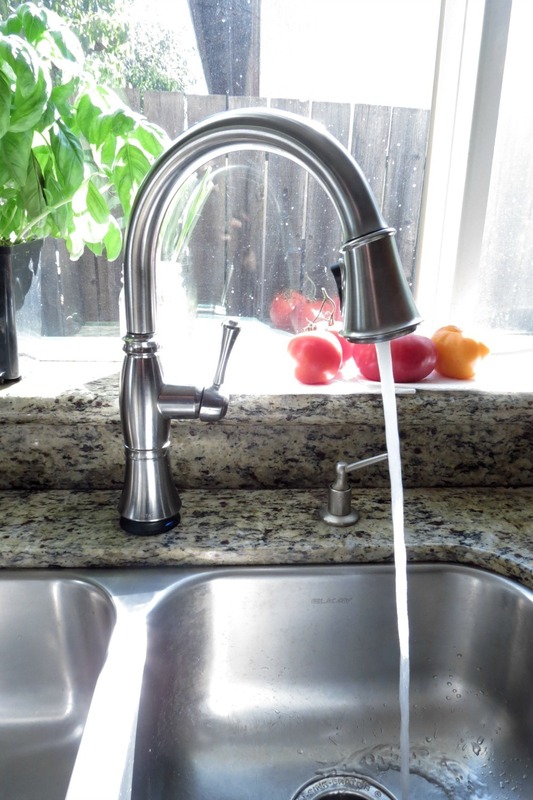 It’s amazing what one little think like a faucet can do to change the look of your kitchen. I know my Husband even loves the new DELTA Faucet. He’s always cleaning it off and I catch him touching it with his elbow to see if it turns on. 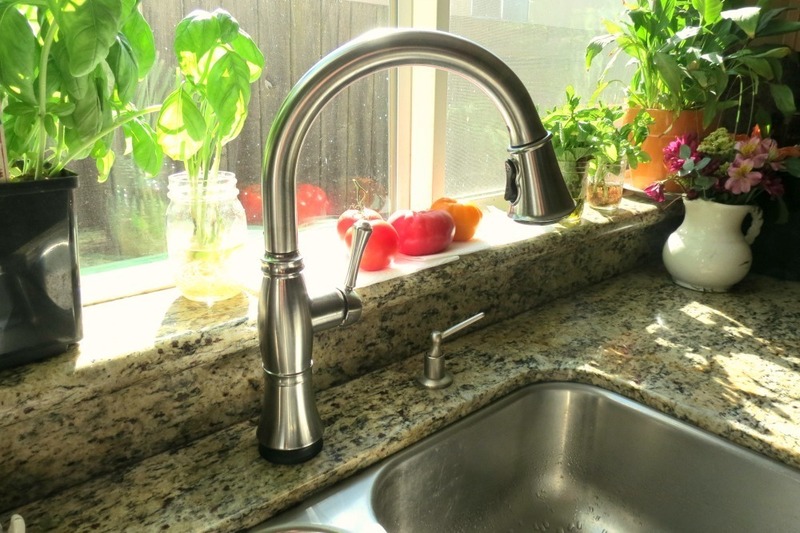 But not only did my DELTA Faucet make my work in the kitchen so much easier, less messy and more convenient, but it also inspired my Husband to start my kitchen makeover. Just last weekend we went to look for granite counter tops to match my existing ones. That way my Husband can build a counter and put up cabinets where my old refrigerator used to be, but also for my birthday I got a new stove. Eventually my kitchen will be remodeled completely but at the rate were going it will probably take a couple of years, but I’ll keep you updated! Here is a picture of my kitchen before my new faucet and after. You can click the picture to get a close up view. Doesn’t it look so much better? Did you notice I got new valances? They really made a big difference in the lighting of the room and make it more cozy. I originally had red and gold valances on the top, but when we re-painted the kitchen from gold to green, the valances did not look right. I love the white color of them too, makes the room so much brighter!! Here are some more shots of my lovely faucet. The faucet has a nice water flow too! Here a picture of it spraying water. It’s one of my favorite shots! Honestly I don’t know what you call this kind of water flow? Here is a shot of it with a straight flow. I just love my faucet. Sigh…. If you have asked me a few months ago about getting a new faucet, I would have shrugged my shoulders and thought ehhh! But now, I think oh my gosh, I am missing out! This is not an ordinary faucet, but one that is fun, professional and so convenient. I really love that when my hands are messy with cookie dough (yes I eat cookie dough)or raw meat or just plain dirty, I know I won’t be spreading bacteria or dirt on anything! It’s so much cleaner and safer! You have to love that! Now only if I can get my soap dispenser to put soap on my hands without touching it!! Do they make that? If not, I think I see a new invention on the horizon! If your curious to see how I got my start to my mini kitchen makeover you can check out my other previous posts. The first one is the quiz and finding out what kind of Style you have and what kind of Kitchen you have. The quiz is fun, check it out! The second post is the start of my makeover and my Pintrest page that inspired me and gave me ideas on my dream kitchen. I may not get my actual dream kitchen, you know white cabinets and gray counter tops, but at least I am getting a nice one. Plus you can check out pictures of my kitchen. You can go here. If you want to check out all the fun things DELTA Faucet has to offer, and even get some new ideas for your kitchen and bath, check out their Inspired Living page! So many great ideas, even if you just want to spruce up your kitchen. I have to say I’m pretty jealous. I have a white stained plastic trainwreck of a faucet. Stupid rentals. I have had my share of rentals, so many that I think I need like four hands to count them all on. So I understand!! You are going to LOVE this faucet! Just wait till you start to use it. You will never go back to a regular faucet again. How nice your getting a kitchen makeover. Will you be sharing pictures on your blog?? Oh man I need a new faucet. This one is pretty! Thanks Emily! We really love it!! It makes a big difference working int he kitchen. I have had one of these touch faucets for over 2 years. I love it. So embarrassing when I go to other peoples houses & accidently start hitting their faucet to make it go!!! lol, I do the same thing! I have so much fun with the faucet! It’s so handy!